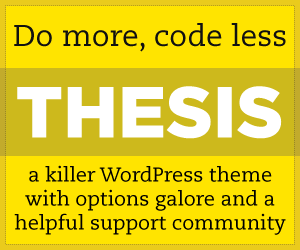 Among premium WordPress themes, Thesis is one of the best I’ve seen. Thesis looks clean and professional right out of the box. But what really sets Thesis apart from the others is its focus on my four pillars of good theme design; seo, speed, usability and productivity. I’ve discussed these criteria in a previous post, but it’s worth going through them again here as they apply to Thesis. First off is SEO. SEO is tricky for a few reasons. 1) No one really knows Google’s algorithm except for Google. Meticulous testing has revealed many of the details, but it’s a stab in the dark or a good guess in many cases. 2) SEO and design don’t always agree with each other. Designers want to make things look good to humans and SEO experts want to make things look good to the search engines. Both are necessary and there’s a trade off involved. 3) SEO is a moving target. Google and other search engines are constantly making adjustments to their methods and so to maintain rankings and search engine position requires continual vigilance. In terms of SEO, Thesis has a few advantages. The core development effort is aware of SEO best practices and has made it a focus from the beginning to balance SEO with good design. The large install base for the theme and the caliber of the blogs that use Thesis provide feedback to the developers which improve the core even further. Finally, the proper use of css and XHTML (standards compliant) ensure that automated bots (from the search engines) can find the keyword information you include in your posts easily. One of the most significant factors in the success of WordPress as blogging software has been the theme and plugin architecture. You don’t have to be a programmer to understand how appealing it is to be able to modify a WordPress blog without having to do a lot of programming. One problem that comes with this flexibility is that there are a lot of poorly written themes and plugins. Each task that you want your theme or plugin to do requires processing, which can potentially slow down your website. Here again, Thesis does an amazing job because it was a focus from the beginning. The core development effort is aware of how WordPress is supposed to work and they have made very deliberate choices to make the theme as fast as possible. This has two outcomes. First is that visitors to the site have a better experience. Research has shown that faster sites get more clicks. People are more willing to explore the site when each page loads quickly. The second is that you can accommodate more visitors to your site without performance degrading. I suppose a third would be that Google has just announced that the load time of a website is now a factor in ranking, which means that a fast theme brings SEO benefit too. When a user comes to your site, they want to find the information that’s most relevant to what they’re looking for. The Thesis team has found a great balance between design and SEO that gives the user a very clear path to the information that’s of greatest interest to them. In addition to good design, they fully support the customizable widgets that are built in to WordPress. This gives you ultimate flexibility when tweaking your site to increase conversions. Finally, the breadth and quality of the customization options available in Thesis means that you don’t have to fight with your blog or know how to code to get the results you want. You’re productive from the first moment using nothing more than your web browser to configure your site. This may be the most immediate benefit to using Thesis. You get to stop thinking about how to do this or that and instead focus on your content. Thesis gets out of your way and helps you do what you do best.